Educators are notorious for arriving at school early and staying way past the end of the school day. Even the weekends aren’t off limits. Some work in their classrooms part of Saturday and return on Sunday. Many times these educators find themselves being asked to leave by the custodial staff. It’s time to blow out the midnight oil flame once and for all. That’s a question I had to answer and the birth of my twin boys was my wake up call. Before I had my children, I would arrive at school around 7 a.m. and leave by 7 p.m. I always had something do. I needed to adjust a lesson plan, I had to research a topic, plan a huge project, make copies, update the bulletin board, grade, call parents, meet with colleagues, organize a field trip, plan for my tutoring group, etc. I felt like there were never enough hours in the day, so I arrive before school and stayed after school to get caught up, but the problem was I never got caught up. The list of tasks to complete was unending. During my fourth year of teaching, I had a high-risk twin pregnancy. This pregnancy resulted in me being taken from my school in an ambulance. Shortly after that, my doctor requested I work only half days. Then, three months into the school year, I had to stop teaching altogether and was placed on bedrest for two months at home and then I was admitted to the hospital and stayed on bedrest there for another two months. After all of that, my sons were born 10 weeks early. During those four months when I was confined to my bedroom or my hospital room, I started worrying about how I could do this, be a good wife, mom of twins and an educator. I knew I needed to change what I was doing, but I didn’t know how. I decided I was no longer going to arrive at work before my contracted arrival time unless I had a meeting. I also decided I would not stay after work more than one hour unless I had a meeting. If a person spontaneously asked me to stay after work without scheduling it with me in advance, I would say no unless it was a dire emergency concerning a student. It’s hard to tell your colleagues no. You might even fear this statement, “You’re not a team player.” I let my colleagues know that I was more than happy to meet with them, but my time is valuable and I can no longer agree to last minute requests. Now, as an academic coach, I follow this rule. The teachers I coach know I have a schedule and they have to schedule time with me. I found having time limits on working outside of the school day made me use my time more efficiently. I’ll be the first to acknowledge teachers don’t always have their preps. Preps are frequently used for PLCs and parent/teacher conferences. When you do have your prep, you have to maximize your time. This is not the time to go across the street and get coffee or to go to your colleague’s room to hang out and vent. This is a time to get work done. When I have my prep, my door is closed. If someone needs to talk to me, I inform the person I am busy. If they must speak to me, I let them know they have five minutes, unless it is an emergency or an administrator. If I have time during the day to work and I waste it, that’s my fault. As an English educator, I argue we have the most to grade, but even we don’t need to assign a grade to every assignment. When I returned to my classroom after having my boys, my school went 1 to 1 with technology and my students all had Chromebooks. I used Google drive and Google docs for everything. We even created videos that I uploaded to YouTube. Instead of grading every single assignment, I had a dialogue with my students using the comment featuring in Google Docs. I didn’t need to put a grade in the grade book for completing the brainstorm, then a grade for the outline, then a grade for the rough draft if I created a culture of dialogue and revision. Then, when I would grade the final assignment, it was less work and I didn’t grade everyone’s assignment on the same day. Put out the flame at home too. 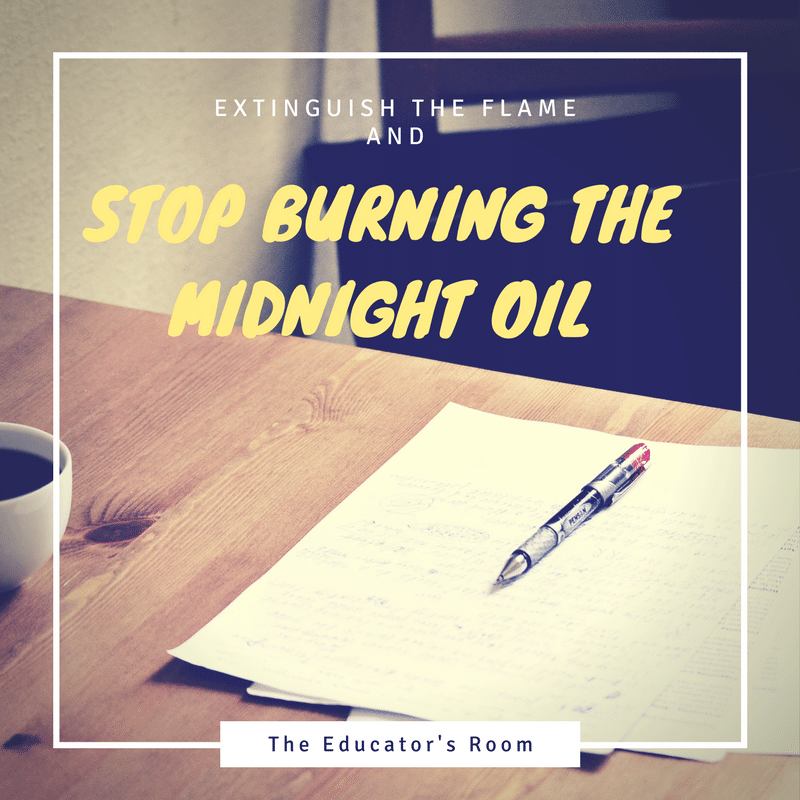 I know educators who arrive when their contracts tell them and leave when their contracts tells them to leave, but they burn the midnight oil all night long at home. I have parameters for working at home too. I will work no longer than an hour at home. I also don’t bring papers home anymore. Although I don’t teach in a school that’s 1 to 1 with technology anymore, my students still do most of their work online. I constantly reserve the computer lab, the laptop cart, and the iPad cart. At home, I will hop online to respond to my student’s work or work on a lesson plan and when the time is up I’m done. But how can I be an effective teacher if I don’t come to school early and stay after the final bell rings? I had a student joke with me once that all I needed was a cot, change of clothes and a place to shower at the school since I was always there. That stung, but it was the truth. During that time, my husband was more like my roommate than my spouse. I was going home to check-in, but I was living at school. Being a teacher is only part of who I am and it should not consume my whole being. I’m a wife, a mom and so much more. Wouldn’t it be a shame if I sacrificed everything for my job and my family or my life fell apart in the process? This is why I made these changes and why I hope you would consider making changes too. Great article – I 100% agree about the need for keeping boundaries! Thanks, Jennifer. Boundaries are so important. It is one way to take care of yourself.